She will tell you, with a smile and a gleam in her eye, that the first time she visited the Carmelite Sisters at their Sacred Heart Retreat House in Alhambra to attend a junior high retreat was because she thought she was going to a slumber party. And yet here it is, 40 years after professing her first vows, and Sister Regina Marie Gorman is not only the current Vicar General of her bustling religious order, and chair of the National Conference of Major Superiors of Women Religious, but also a nationally-known and much-sought-after spiritual speaker and retreat leader. Those who attend her talks and retreats are certainly delighted by her ready smile and quick sense of humor — and they are just as impressed by her wealth of knowledge, her deep Carmelite spirituality and, most of all, her love of the faith. It has served Sister Regina Marie (and the Carmelites) well as a teacher, administrator and nurturer of young women religious. Sister Regina Marie, born in Detroit, moved as a young girl with her family to Louisiana and then Glendora where she attended St. Dorothy School and St. Lucy’s Priory High School. She graduated from Bishop Amat High School, La Puente, and briefly attended Citrus College. By that time, however, her life was heading in a new direction — not the one she’d planned on by any means. It started with the aforementioned junior high retreat at Sacred Heart. What kept her on track? “I was so in love with the person of Jesus Christ,” Sister Regina Marie says, breaking into a smile. Still, she kept this all to herself until she entered the convent on Oct. 1, 1972, professing her first vows in 1975. She continued her studies at Mount St. Mary’s College, and eventually earned her teaching credential at Cal Poly, Pomona (and later, a Master’s in Christian Theology and Ministry at Franciscan University). She spent nine years teaching junior high at St. Philomena (Carson), Holy Innocents (Long Beach), Holy Family (Wilmington) and Sts. Felicitas and Perpetua (San Marino). Like her entry into religious life, teaching was not what she’d initially planned on. From there she worked in administration, nine years as directress of novices. “I loved that experience in the novitiate,” she says. “I worked with beautiful, motivated people.” That was followed by vocations development and then twelve years as Superior General. Most of all, there is Venerable Mother Maria Luisa Josefa of the Most Blessed Sacrament, a.k.a. Mother Luisita, foundress of the order in Los Angeles on June 24, 1927, and a candidate for beatification. 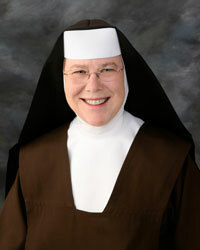 There are many Catholics in Los Angeles and beyond who could say the same about Sister Regina Marie Gorman.